How do you set a trimpot for a specific voltage? Using a voltmeter, place the red probe at the specified test point (such as the drain pin of a FET) and touch the black probe to the ground rail. Adjust the appropriate trimpot accordingly, based on the voltmeter reading. 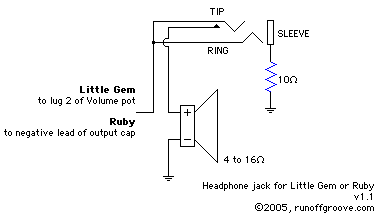 How do I add a headphone output to the Ruby or Little Gem? Be careful! Using headphones at higher volumes can damage your hearing. What speakers do you recommend for use with your mini-amp circuits? While the Ruby, Little Gem, and Little Gem MkII practice amps can be used with any speakers, best results are achieved with full-size speakers intended for use with guitar amps. The amps will work well with an total impedance of 4, 8, or 16 ohms. We've tried hi-fi speakers, clock-radio speakers, and auto speakers - they just can't cut it. For me, using anything other than a speaker designed for the frequencies of an electric guitar produced sounds more like a toy than an actual amp. However, you may want to ask at Aron's Stompbox Forum. Many of the members have built one of the aforementioned amps and may be able to suggest a decent-sounding small speaker. Is a separate cab sim necessary when using a FET-based distortions and recording direct? What about when playing through a headphone amp? We suggest using a cab sim when recording direct or playing through headphones. Without the aggressive frequency shaping of the Condor Cab Sim, the overabundance of treble content will seem harsh and unrealistic. The passive filtering in those circuits is adequate when using them with an amp, since the amp's speaker picks up where they leave off. The greater frequency response of the sound card input or headphones requires the more efficient active filters as found in the Condor. I'm not very good at reading schematics. Can I just use your perfboard layout instead? No. You need to understand and follow the schematic to build a working circuit. On our perfboard layouts, all the necessary ground connections and other off-board wiring may not be shown. Our perf layouts are simply a guide for physically arranging the circuit when building on perfboard. They are not an alternative to the schematic, but rather a companion. Can I use one of your FET-based distortions to drive my Ruby or Little Gem amp? When placing any distortion circuit before a 386-based amp, you need to keep the output volume at the same level as the dry guitar signal. Otherwise, you'll overdrive the 386 and lose the character of the distortion. What does 1k5 mean? What about 4n7? How do you draw perfboard layouts? You can use nearly any drawing/painting application to create layouts. We usually start with a hand-drawn layout on one of the perfboard templates. The basic approach to re-drawing it with the computer is nearly the same for any software. Start with the blank perfboard image. Then, using a "library" of components, arrange them on the perfboard. I'd like to create a PCB layout for a runoffgroove.com circuit and post it on my website. Is that OK with you? Sure! All we ask is that you include a link to this site and include "(circuit name) by runoffgroove.com" as part of the PCB layout artwork. Also, please do not include our original copyright-protected schematic. Can I use a power supply higher than 9 volts with the tube-amp-inspired distortions? Yes. Make sure that all your components are appropriately rated for the voltage you're using and bias the FET drain pins to half of that. How do I add a fuzz control to the Sili-Face or Sili-Face II? If you need a fuzz control, we recommend using the same arrangement shown on Joe Gagan's EasyFace. Visit GeneralGuitarGadgets.com for the schematic. Are the tube-amp-inspired FET distortions used differently than other pedals? Can I hook them up to a speaker? No, they're regular stompbox circuits and cannot directly drive a speaker. Use them in the same manner as any effect pedal. What happened to the old articles and sound clips? They are archived at home-wrecker.com. The older content was removed from this site to emphasize our focus on original designs. Where do you buy parts? Small Bear Electronics. Great prices, selection, and service. Steve Daniels is the best supply source for the DIY-FX community and will ship nearly anywhere. Why isn't there a switch shown on many of the schematics? Often, the switch is omitted when drawing schematics since it is nearly the same for every effect. GeneralGuitarGadgets.com and AMZ both offer comprehensive bypass switching diagrams. Also, GEOfex.com has an informative article about wrappers - the parts common to nearly every effect. Do you have any general suggestions for building? Use sockets for transistors, ICs, and sometimes caps. Always install the correct parts, as noted on the schematic. Substitute parts at your own risk. Try the circuits in their stock form before starting mods. Do the projects work? Do they sound good? Our projects are developed and independently tested by both of us before release. The sound clips are meant to be as representative as possible, but your results may vary since you probably have different equipment. We wouldn't post non-working circuits or lousy sound clips. Can I send you something to post at runoffgroove.com? Participation at runoffgroove.com is by invitation only. Please do not send original schematics, clone build notes, or sound clips for us to post. It is better to share them at Aron's Stompbox Forum, or better yet, build your own website. The term refers to the innermost groove of a vinyl record. When playing an album on a manual turntable, the needle remains in this "dead end" area until you lift the tone arm and flip the disc. This is also where secret messages from the artist or engineer can be etched into the vinyl.